Is it just me, or are Anastasia Beverly Hills completely crushing it with their every release? They can do no wrong at the moment and their latest product: The Ultimate Glow Kit ($45) appears to be no different. They just released the Master Palette by Mario read my thoughts on that $45 palette here. This review is going to be a lot shorter because I don't feel highlighters have as much criteria to tick as eyeshadow. 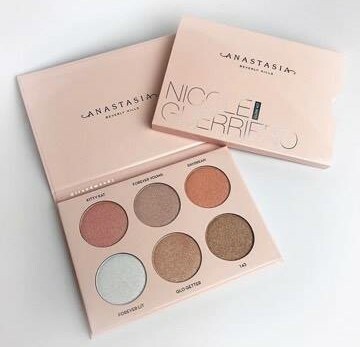 ABH are already world famous as a result of their previous glow kits which have done incredibly well in this glow-obsessed world we currently live in. Most of you know by now that I am not a girl that dies for highlight, contour yes all the way I want cheekbones that could cut you, but for me highlight is unnecessary. I can, however, just like you, appreciate a good palette. This is bigger than most of their palettes apart from Moonchild Glow Kit, which also possesses six powder highlights. 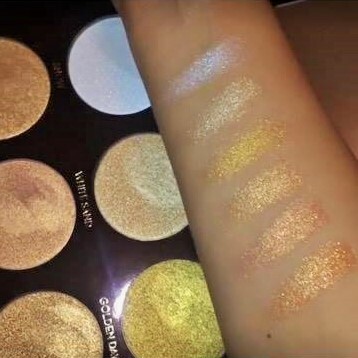 The Ultimate Glow Kit is like the polar opposite of the celestial, cool-toned goodness of Moonchild, nearly every shade in this Glow Kit is warm with golden, yellow or bronze undertones apart from the shade Snow which is like cocaine glitter on the skin. Golden Dawn especially looks very warm when swatched. Let's have a look at the shades individually. Overall, the shadows look mind-bogglingly pigmented in all the swatch photos, like eyeshadow pigmented. They also seem to have a fair amount of glitter to them, the "reflect" or "lustre" as they prefer to call it which is essential in most highlights seems to be particularly high in quantity in these shadows. 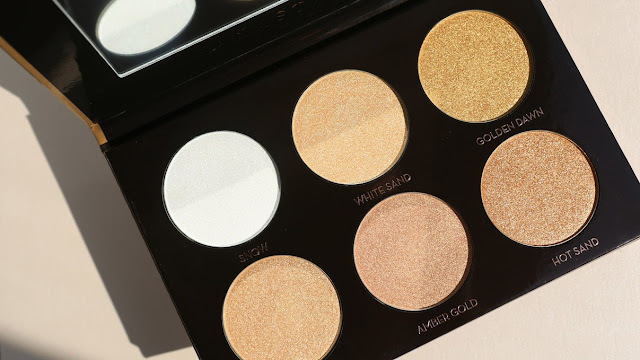 This palette will definitely make you glow for the gods and would not be for the faint of heart. I do think it is a nice palette. I don't really like how a lot of the darker colours are so similar (i.e. Sunray, Amber Gold and Hot Sand) but they will appear differently on differing skin tones so that is something to bear in mind. I think if you have quite tan/olive skin a lot of the shades will look very similar on the skin so swatch in store if you can before you purchase. I will not buy this palette because I don't like glittery highlighters. However, if you like super pigmented, can see you from space, need to wear sunglasses and hold a parasol kind of highlight then you will love this palette! Thank you so much for reading, I hope you enjoyed this look at The Ultimate Glow Kit. 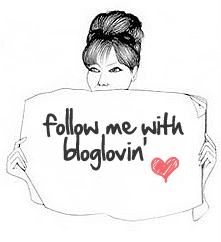 Please don't forget to follow me on Bloglovin' and leave me a lovely comment, my Twitter and Instagram links are all below so let's connect. I am almost at 50K on Instagram which is crazy. 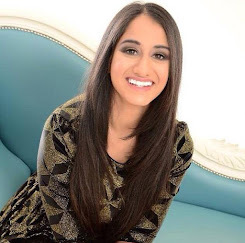 I have Snap Chat too: alittlekiran, so come say hi so I can talk beauty to you guys. Lots of love. Take care. 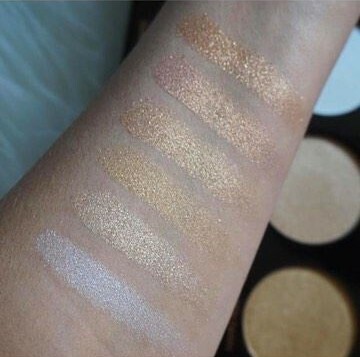 What is your holy grail highlighter? Same! I hate that it's always more expensive over here, hurts my little heart. I hope it's not as glittery in real life and I'll update the review as soon as I can get my hands on it :) thank you for commenting! This palette is gorgeous I love the colors! This is such a pretty palette! ABH is just coming out with so many things and my wallet can't handle it! 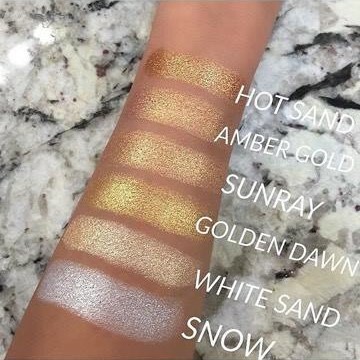 These swatches are amazing! I love Amber gold, definitely would like something like this in my collection!